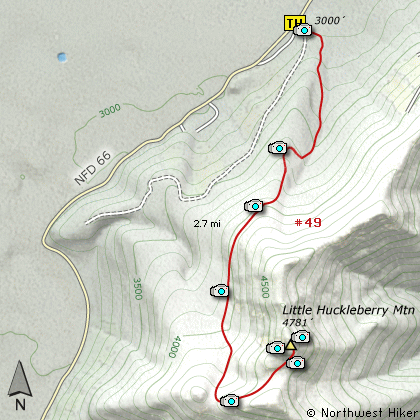 This hike up Little Huckleberry Mountain begins on a side road off Forest Road #66. The trail begins in a forested area and is fairly level for just a couple hundred yards, then it becomes very steep. As the trail climbs it wanders in and out of heavily forested areas and at about 3/4 mile it crosses the ridge line and enters a densely forested area for most of the remaining distance. The trail does do a little up and down and it makes its way below the rising ridge line. At nearly 2 miles you will come to a place referred to as Spring Camp. Just after this spot, the trail takes a hard left turn and climbs up onto the southwest flank of Little Huckleberry Mountain. In a short distance the trail breaks out into the open and remains there for the rest of the climb to the top. From this point on you will be able to see many of the surrounding volcanos, such as Mt Hood to the south and Mt St Helens to the west. When you reach the top you will have great views of Mt Adams to the northeast and Mt Rainier to the northwest. From Portland, travel east on Interstate Hwy 84 to Exit 44 to Cascade Locks. Exit the freeway and cross over the Columbia River into Washington via the Bridge of the Gods. Then turn right, or east, and head east through Stevenson, Washington to the intersection of the Wind River Highway to Carson, Washington. However, just continue east on SR14 for another 8.8 miles and you will come to the Cook-Underwood Road. Turn left onto this road and follow the signs to Willard, WA. In about 6.7 miles you will drive through the quaint community of Willard. Continue north and in about a half mile you come to a major junction. Bear left onto Forest Road 66. Continue on FR66 past many spurs and side roads for another 12 miles as you skirt a large lava bed to your left. Soon you will come to what appears to be a side road that parallels FR66. This road is the parking area for the trailhead to Little Huckleberry Mountain. From Vancouver, WA travel east on SR14 through Stevenson, Washington to the intersection of the Wind River Highway to Carson, Washington. However, just continue east on SR14 for another 8.8 miles and you will come to the Cook-Underwood Road. Turn left onto this road and follow the signs to Willard, WA.